Epact: Measuring Rod unsigned, late 16th century ? 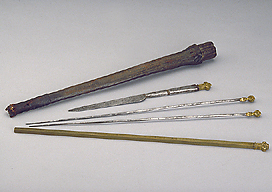 This set of measuring rods consists of a leather case, a calibrated square rod, two pointed rods and a knife. The square rod carries gunner's gauge scales and was therefore intended to measure shot, but the purpose of the pointed rods and knife is not entirely clear. The objects are neither signed nor dated, but the style of the decoration and the language used suggest that they are German and were made in the late 16th century.